Dear friends – I am sharing the following information in the hopes of helping people learn how to detox radiation and heavy metals from the body. Metals are actually conductors and they make our bodies more attractive and receptive to RF/EMF/microwave frequencies. This is why it is important not to sleep on a mattress with metal coils. I have been using foam mattresses instead. I got my foam mattresses used so they do not off-gas a bunch of toxic chemicals into my home. Sleeping in a metal free environment is essential for those who are EMF/microwave sensitive. We just need to take the extra effort to clean up our environment, one step at a time, and things will get better. I know when I began feeling ill, there was a very strong feeling of hopelessness and despair. I did not know where to begin to help myself get better. An “opt-out” digital meter had been installed on our home and we were all being exposed, 24/7, to microwave radiation as a result. It took me about 7 or 8 weeks to get the utility company to remove that genocidal, toxic device and since then it is possible for healing to occur. You can read about my story here and here. Several other things had to take place in order for healing to unfold. THE WIFI ROUTER IN MY HOME ABSOLUTELY NEEDED TO BE TURNED OFF. I discovered the seriousness of what was being emitted from this device once I purchased an EMF/Radiation meter and could see that the amount of radiation coming off the router was more than the meter could count. And this was so even after covering the device with EMF protection fabric twice. Here is the radiation meter I bought and here is the fabric I bought for shielding the meter. All internet service in our home is now ethernet wired. This task was actually much easier than I had expected. I purchased devices that enabled me to run the internet connection through the electrical wiring of my home. These are the devices I bought. They come in pairs. One you plug into the cable modem in your house with the other end of the cord going into a grounded electrical outlet nearby. This brings the connection through the electrical wiring of the house. After you do this, then you plug the other device into a grounded electrical outlet in what ever room you want to work in with the other end going into your computer, and voila! You can turn your WIFI OFF and you will still have excellent, uninterrupted internet service. I had to purchase a few extra devices like an ethernet adapter for my MAC computer (Can you believe they make computers without ethernet ports???? Outrageous!) I had to also purcahse ethernet cables so they would be as long as I needed. Also I bought an ethernet splitter which provides me with several additional ethernet outlets should I choose to add more ethernet cables in my house. Other things to change in the house include getting rid of the dect cordless phones which are pumping 2.4 BILLION HERTZ of microwave radiation into our homes 24/7. At the very least, the parent base of the phone system needs to be unplugged at night. You can replace these with the older 900 MHz (only 900 million hertz) cordless phones if necessary, or simply get a CORDED phone. Same thing goes for cordless printers (off the charts in terms radiation) and wireless alarm systems and basically any cordless or smart devices you have in your home. My advice – get them all out now before people in your house get sick. When then power up this grid to 5G (up to 90 BILLION HERTZ), many, many people and children and pets (and critters of all kinds) are going to get sick and die. If you are motivated enough to try to stop this assault, then you should do that. If you are not that motivated, then at least take the steps necessary to protect yourself and your family and clean up your home because if you don’t, things could very bad very quickly. If you have children in schools with wifi, know that they are in extreme danger. If you are going to libraries that have wifi (and probably smart meters as well), know that these building are often IN THE RED in terms of radiation danger. I recommend purchasing an EMF/radiation meter for yourself so you can see what is going on in your environment and help to alert others to the danger. Firefighters and police officer are in extreme danger as towers and antennas are going up on their building or right next to them. I recently received information about firefighters in California who were becoming mentally confused and unstable as a result of radiation exposure from these towers and antennas. These once powerful, strong, healthy men were suddenly getting lost in their own neighborhoods – neighborhoods where they had been living for decades. 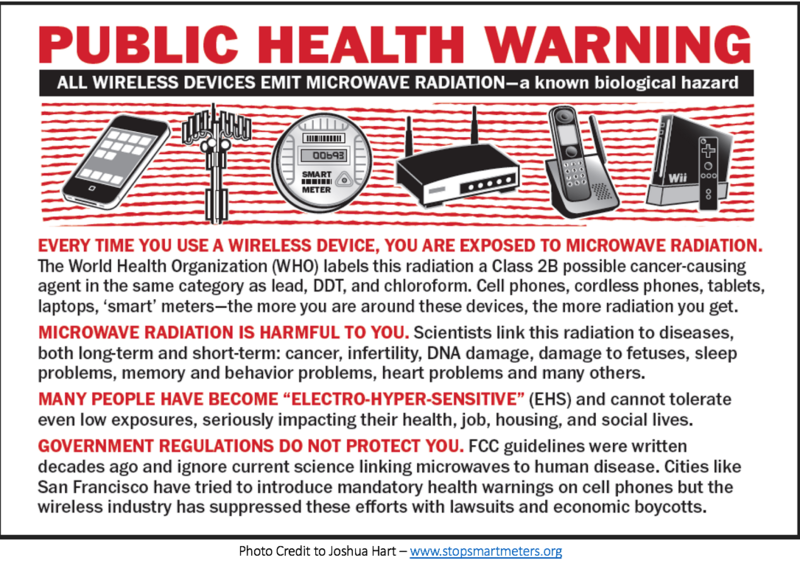 Brain damage and cognitive decline are definitely side effects of microwave radiation poisoning. This is partially because artificial radiation has the capacity to perforate and open the blood brain barrier and partially because it destroys brain cells, among many other serious issues. Please warn your friends and family about this in case they might know a police officer or firefighter who may be being exposed. Of course, it goes without saying, that anyone involved in working for the communications industry, especially those who are putting up the towers, installing smart meters, etc. are all in great danger. Please alert people to this fact and encourage them to visit this website for more information. If you have found this information helpful, please also consider making a donation to help me maintain this website and keep the information coming. Below is info regarding products that may help you detox your body from radiation. More info on this will be forthcoming. The following information should not to be taken as medical advice. I am just sharing what I am doing to help myself in the hopes that by sharing this, I can help others. Drink Fiji or Volvic Water for 13 weeks as per this article to detox aluminum from the brain. Following the mineral water protocol, drink distilled water for about 6 weeks to pull toxins out of the body. I do not recommend drinking distilled water for the long term because it is dead water and cannot help with the regeneration of cells. We need LIVING water to regenerate our bodies. See this book for more information on that. Iodine according to your body’s comfort and need. I take a few drops a day. Some people take much more. Start slowly and see how you feel. I use this type of iodine. Pyrophillie clay (otherwise called “sacred clay“) to pull radiation and metals out of the body and replenish the body with minerals. I take it internally once or twice a week and put it in a bath at least twice a week. Some people prefer bentonite clay. Modifilan (brown seaweed). I get mine from Russia. Here’s the link. Aloe Vera Juice. I use George’s Aloe Vera. Restore – to help correct mitochondrial damage and heal gut/digestive issues and more. Please visit this link and write to Sofia to ask about her “friends and family” package. Tell her I sent you! Royal Jelly, Bee Propolis, Bee Pollen, Organic Honey. Local is best.